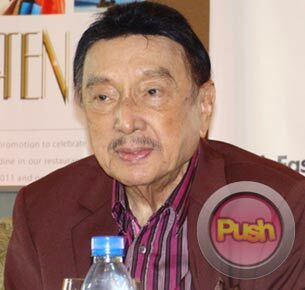 At age 82, Dolphy continues to earn accolades for his contributions to showbiz. King of Comedy Dolphy recently received an award in recognition of his six decades in showbiz. The veteran actor was awarded the Golden Collar of the Order of the Golden Heart, last November 9, considered to be the highest honor given to a civilian and which was awarded by President Noynoy Aquino. "Sobrang bigat din ng honor ko dun kasi dalawa lang kaming tumanggap ng ganun, 1954 pa 'lsquo;yung una," Dolphy beamed. Dolphy cited actors-turned-politicians who have voted that he get the award such as QC councilors Alfred Vargas and Roderick Paulate. "Parang anak ko 'lsquo;yang si Roderick. Well, sabi ko nga kung bibigyan ako ng National Artist [Award], okay lang. Sabi ko maski 'lsquo;di ako mabigyan, at least itong natanggap ko nung Martes, ako lang meron na buhay pa," he said. At age 82, the Comedy King shows no sign of retiring yet and is coming up with a Metro Manila Film Festival entry titled, Father Jejemon. He also recently launched his music album entitled Handog Ni Dolphy: A Lifetime Of Music And Laughter under PolyEast Records. Dolphy also proudly said that there are selections where he did duet with partner ZsaZsa Padilla, son Vandolph and daughter Zia. There are 10 tracks and said that his favorite track is revival song "Handog." "Pati ang areglo (arrangement) maganda. Tsaka very meaningful na sa akin 'lsquo;yung kanta."